I have just received a letter from the Labour Party informing me I have been suspended on the basis of comments I am alleged to have made. Naturally no indication has been given to me as to what these comments might consist of or indeed who made the allegation. I can only assume, in the current climate of media engineered hysteria over ‘anti-Semitism’ in the Labour Party and amongst Corbyn supporters, that it is related to this. I can think of no other reason. If this is the case what is involved is a witch hunt of anti-Zionists using the cover of anti-Semitism since even the Zionist Board of Deputies of British Jews (BOD) and other Zionists have acknowledged my role in combatting Gilad Atzmon, a notorious anti-Semite who used to be associated with the Palestine solidarity movement. So when he is under attack his immediate response was to plead to the “Zionist Board of Deputies of British Jews (BOD) and other Zionists” to defend him because he has given them Gilad Atzmon’s head on a plate and they should reciprocate the favour. His postings are almost entirely devoted to Zionism and anti-Semitism and his narrow focus strays outside that very infrequently, as you will see if you follow the link below. Socialist Fight, the current target of his witch hunt, opposes imperialism in all its manifestations in every major conflict. We are particularly focused on opposition to British imperialism in Ireland; every one of the 25 issues of our magazine so far has carried a list of the Irish Republican Prisoners and defended their right to oppose the British occupation of the north of Ireland. No other left group in Britain, apart from the Revolutionary Communist Group, pays such attention to Britain’s oldest colony and the touchstone for the anti-imperialism of every British socialist. Few make the grade now. We have stood in the forefront of the opposition to the imperialist attacks on Libya in 2011 and never gave any credence to the ‘Benghazi rebels’ and their bogus CIA sponsored ‘revolution’. Likewise with Syria and Iraq and Ukraine etc. The majority of the rest of the left disgraced themselves in supporting the war aims of their own and US imperialism. Tony Greenstein has no such record. He was appalled at Gerry Downing’s defence of the third world victims of US imperialism; it was the chickens coming home to roost. Tony Blair himself admitted that there would never have been an ISIS if he and George Bush had not invaded Iraq in 2003 using the false claims about weapons of mass destruction. The war criminals did not draw Tony Greenstein’s ire in his article on it in the Weekly Worker but that Downing had not capitulated to the pressure of the imperialist politicians and mass media in Britain. I learned from the Jewish Chronicle today that Berkshire Jews are “horrified” because yours truly has “challenged Holocaust denial legislation.” What caused the present outbreak of Pre Traumatic Stress? Apparently, my Sunday book launch at the Reading International Festival. First, I am sorry to hear that my questioning of Jewish identity politics and culture have created a state of Jewish collective horror. I would be pleased if any Berkshire Jews would bravely dare to attend my talk on Sunday, they may discover that they agree with most of my observations. But what is it in my new book Being in Time – A Post Political Manifesto that inflicts ‘horror’ on Berkshire Jews and other Jewish institutions? No one knows. The book has been well-reviewed, and no one has yet found any factual mistakes or a methodological flaws in the text. If they want to burn it then you certainly want to own a copy. In the last few days, British Jewish institutions have used every trick in the Hasbara book in an attempt to cancel my coming talk. The notorious CAA (whom Tony Greenstein is correctly attempting to get struck off as a charity – GD) and the ultra Zionist Board of Deputies of British Jews mounted pressure on the venue, they contacted the local council, they harassed local politicians; they even attempted to recruit ‘LGBT activists’ who were asked to pursue the venue. The Jewish Chronicle reports that Rabbi Zvi Solomons of the Jewish Community of Berkshire said that Mr Atzmon is “a notorious antisemite. He has promoted Holocaust denial, compared Israelis to the Nazis.” Other political organizations have taken the accusations against me seriously. They have carefully examined the matter and have found that the claims levelled against me are baseless, malicious and often duplicitous. The Rabbi wrote, “The event organisers did not seem concerned that they were going to be providing a platform to a known peddler of hatred.” I believe that the Rabbi should accept that outside of his congregation, criticism of ID politics, and Jewish culture are considered a legitimate intellectual and ethical adventure. Further, I have been writing on Jewish and Zionist matters for 20 years, and in spite of the strict anti hate legislation in the UK and other countries, I have never been questioned by a single law enforcement body about any of my writings or public speeches, neither here in Britain nor anywhere else around the world. There is an element of truth there. My work has been praised by a wide spectrum of intellectuals: Right, Left and Centre (see here and here). One explanation is that I am dealing with meta-political issues. Rather than advocating a political standpoint, I attempt to offer a method to engage in ethical discussions within a critical philosophical framework. The one thing, neither Arkush, Rabbi Solomons nor any other detractor of mine has ever managed to do is to point at a single critical reference to race or biology in my entire body of work. I do not criticise people, I dissect culture and politics and dig into their meaning. The Jewish Chronicle reports that a small number of congregants from Rabbi Solomons’ 50-strong community plan to hold a protest vigil if the event goes ahead. Two weeks ago, I encountered a similar vigil in Berkeley, California. The event organiser was able to persuade the entire Zionist group to attend the talk. At the end of the talk, some of the Zionists admitted to the organiser that they were persuaded by my argument and were impressed by my delivery. I am looking forward to meeting the Rabbi and his followers. I will, of course, invite them to join the peace lovers inside the Reading International Solidarity building. Jonathan Arkush, the president of the Board of Deputies, said no “reputable event should feature Gilad Atzmon”. More than 30 people staged a protest over the appearance of an antisemitic author at a cultural festival. Gilad Atzmon, an Israeli jazz musician and writer who has challenged Holocaust denial legislation, gave a talk at the Reading International Solidarity Centre on Sunday. Congregants from the Jewish Community of Berkshire and members of Reading’s LGBT+ community held a protest outside the event and were joined by Rachel Eden, a Labour councillor, who organised the demonstration. She was joined by councillors Daya Pal Singh, Richard Davies, and Sophia James. Rabbi Zvi Solomons said the Jewish community was “horrified” by Mr Atzmon’s appearance and “gravely disappointed that it went ahead despite attempts to have it cancelled”. He described Mr Atzmon as “a notorious antisemite. He has promoted Holocaust denial, compared Israelis to the Nazis. “He is not the sort of person any liberal outfit should want to be connected to.” Rabbi Solomons had contacted Reading Borough Council leader Jo Lovelock to express his concern ahead of the event. However the council chose to distance itself from the event claiming it was not responsible for what happened. Jonathan Arkush, the president of the Board of Deputies, said no “reputable event should feature Gilad Atzmon”. He said the Board was “extremely concerned that the Solidarity Centre and the festival organisers appeared happy to host someone with such a track record for openly racist views.” Mr Arkush pointed out “Atzmon’s appearance at events is routinely cancelled when organisers learn about his views and track record”. The centre and Reading Friends of Palestine were unavailable for comment. 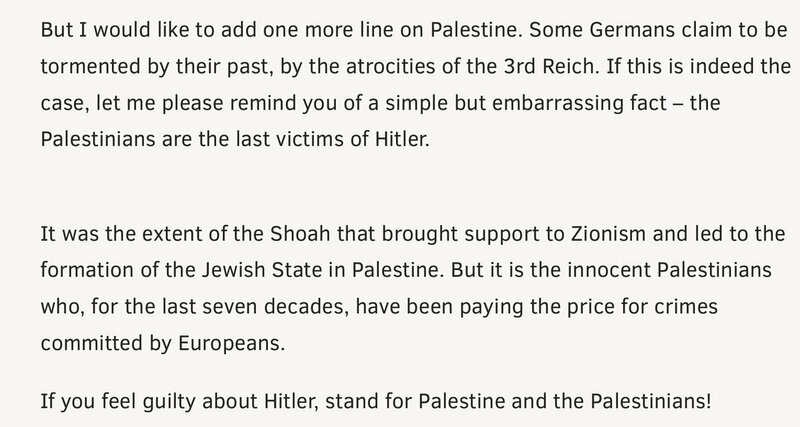 GA: The ultra Zionist Jewish Chronicle allowed a single voice of reason into its letters page this weekend. In a rather belated response to Rosa Doherty’s article of October 24, concerning a public appearance of Gilad Atzmon, I would like to take issue with certain comments reported therein. Rabbi Zvi Solomons is quoted as calling Mr Atzmon “a notorious antisemite”, and says that “he has promoted Holocaust denial, compared Israelis to the Nazis” and Jonathan Arkush, President of the Board of Deputies, holds that no “reputable event should feature Gilad Atzmon”, opinions I respectfully but vigorously disagree with. Firstly, is Mr. Atzmon truly an antisemite? An antisemite as defined by who, and by what criteria? Should we not apply ourselves to these questions before we brand anyone with such a grave charge, however objectionable (nay, offensive!) their opinions be? As far as I know, and I may be wrong, Mr Atzmon has never denied that the Holocaust happened but rather has opposed laws which seek to prohibit its denial; and did Mr Atzmon really compare all Israelis to Nazis, or is his clumsy and admittedly provocative critique of Israeli policies being taken as proof of something much more sinister? Even were Mr Atzmon to confess himself as a most virulent antisemite, both tactically and on principle, the last thing we should do is seek to ban him from “reputable” public events; rather, we should welcome any and every opportunity to debate him and people with similar ideas, with facts and well-reasoned arguments that will show any fair-minded, rational person how ill-founded Mr Atzmon’s discourse is. And before anyone accuses me of being naive and unrealistic in adopting this response, I would counter that to silence or “shut him down” truly plays into genuine antisemites’ hands (e.g. :” Look, the Zionists are trying to shut up honest dissenters again”) and leaves a part of the intellectual field to them. Nevertheless, Tony Greenstein’s successful injunction hearing in the high court on December 7 exposed the appalling politically motivated unfairness and inflexibility in disciplinary matters, not only of Labour’s unelected officials, acting – according to the party’s rules – “under the instructions of the national executive committee”, but also of the 11-person national constitutional committee elected annually by conference. I don’t see a principle against doing that. If the right wing bureaucracy overstep bourgeois legality in attacking the left, it is legitimate to go to court and demand basic justice. We may not get it; if not it exposes the courts. But if we do it strengthens the left. Its a matter of political judgement when to do this. Obviously we do not rely on the courts to promote our overall politics. But if our basic democratic rights are attacked in a manner that flagrantly contradicts the current norms of bourgeois legality then we are obliged to defend them in court if we have the means. Marx did it. Trotsky did it. Its not observing a class line to refuse this, its passive acceptance of attacks on our democratic rights. Where did Trotsky and Marx try to use the bourgeois state as a tool of intervention within the working class? It is a breach of the only principle, the political independence of the working class, to seek refuge in the capitalist state in a dispute with other working class tendencies. How the hell can a tendency without the confidence to prevail within the working class be able to effectively use an alien class apparatus to advance the working class cause? Moreover, it muddies the line regarding the very nature of the capitalist state. While I’m at it: I think you are wrong to defend yourself by means of sophistic definitions of “anti-Semitism,” now a thoroughly skunked term. Here, too, a stand should be taken on principle: nonexclusionism within the left. I know, I know, the CPGB likes to maneuver around the bureaucracies to expel this or that tendency from united fronts. I have no truck with the AWL, but I would never seek to exclude them – even though they would no doubt try to exclude me. Elementary working class principles are of course lost in the neo-Stalinoid mileu of the CPGB. Everything is tactics! That’s of course because they’re such tactical geniuses – look how far tactics have gotten Conrad, who makes fun of Socialist Fight’s numbers when himself living in a glass house. The ruling class as a whole is committed to Zionism – but intensity of commitment matters. How does Greenstein explain away that the two indispensible sources of Trumpist contributions – Sheldon Adelson and the Mercers – are fanatic Zionists who are willing to put their money behind their words. Trotsky sued the Mexican CP for libel when it accused him of being a fascist terrorist or some such. Marx sued Karl Vogt, who was a counterrevolutionary slanderer within the milieux of the movement around the Cologne communist trial. In extremis, I suppose technically you could regard Trotsky’s assassin as part of the workers movement. Trotsky’s guards, when they captured him, could have despatched him themselves. But that would have left them open to prosecution. If you take on the functions of state power, you have to be able to seize it. They were not. So they rightly handed the killer over to the Mexican cops. An extreme example perhaps. But the principle is the same. And i disagree that we are using sophisms around anti-Semitism. The point is that it is racism. That’s what it originally meant. Its the pseudo-definitions that expand that which are sophisms. We are for non-exclusionism within this United Front. We are the only current that is. Do you have a link for Trotsky’s suit against the Mexican CP? National Zeitung, which Marx sued over Vogt’s article, was a far right publication. I don’t think Marx sued Vogt personally. Handing over an attempted murderer isn’t political collaboration with the police. I think we need to distinguish between the ministerial and discretionary actions of the police. Ministerially cooperating with the cops can be necessary, but inviting them to settle what requires discretion (as in the Greenstein matter) is unprincipled. An anti-Semitism, I suppose that whether you declare the term skunked for imprecision or you seek to return it to something closer to its original definition is tactical, and you can probably judge better than I. But stating simply that anti-Semitism is Jewish racism and nothing else leads to absurdities. They may not be important absurdities, but absurdities they are. For example, you would have to say that Dusty is not an anti-Semite.